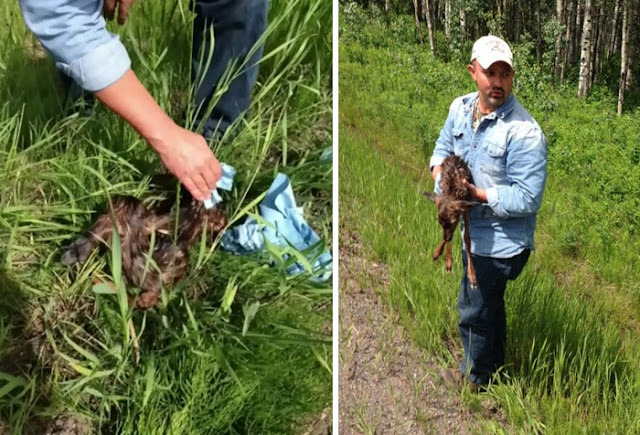 A man saved the life of a baby fawn by performing an emergency C-section on her dying mother. Sean Steele and his wife, both from Alberta, were driving along a highway in British Columbia on June 10 when they noticed a deer to the side of the road which had been hit by a car, reported the National Post. The kind-hearted couple stopped to see if there was something they could do for the deer, but it was too badly injured and was dying. That's when Steele noticed a little hoof protruding from her bloated belly. The deer was pregnant and her fawn looked to be ready to make her appearance. Steele said he instinctively grabbed a knife and cut open the mom, performing an emergency C-section, and removing the fawn from her mother's belly. It was a girl. The man, who had experience delivering calves, knew to wipe down the fawn with his shirt and then clear her mouth airway with his fingers - he even shoved a little grass up the critter's nose to get her to sneeze and clear out her airways. He and his wife then set about to find colostrum, a high protein milk needed by newborn animals in the first 24 hours of their lives. The fawn lives in an outdoor enclosure already and will soon be transitioned back to the wild. 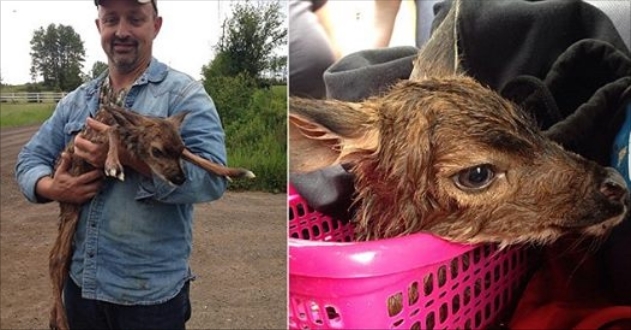 Responses to "Man saves baby fawn from pregnant mother deer hit by car by performing emergency C-section"